Cheryl Williams officially announced her pick for Vice Chairman (and no, it's not Richard Engle) today. Here's the press release. Former congressional field representative and Norman attorney L. Don Smitherman has announced that he will seek the Vice-Chairman slot for the Oklahoma Republican Party at the Republican State Convention on Saturday, April 18, 2009. Party rules require the Chair and Vice Chair to be of different gender. Smitherman will team with current State Vice-Chair Cheryl Williams in her campaign for Oklahoma GOP Chairmanship. 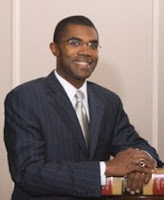 Smitherman received his Bachelor of Business Administration Degree in Finance from the University of Oklahoma in 1989 and his Juris Doctorate from the OU College of Law in 1992. He served as field representative and staff counsel for Congressman J.C. Watts from 1995 to 1998. He has been a practicing attorney since leaving Watts’ office in 1998. Throughout his legal career, Don has also served as an Oklahoma Merit Protection Commissioner and as an adjunct professor at Rose State College. Finally, he played both football and baseball for OU from 1985 – 1989. “I am thrilled that Don has agreed to be a candidate for Vice Chairman. He is a bright, young and energetic leader who brings much to the Oklahoma GOP table. Don Smitherman truly epitomizes the future of the Republican Party and I am honored that he has joined our team,” Williams concluded. According to party insiders, this could be a signal that J.C. Watts is seriously considering a run for Governor. Sources say that Smitherman would not do something like this without consulting Watts first. It would be advantageous for a potential Watts campaign to have Smitherman as Vice Chair. This also indicates to me that Cheryl Williams realizes that she cannot win with a Vice Chair candidate more along her style (like a Richard Engle or a Charlie Meadows). She has to pick someone more appealing to the party in general. If these speculations are true, I would not be surprised to see J.C. Watts announce for Governor at the State Convention, with the distinct possibility of Watts endorsing and/or introducing Cheryl Williams during the State Chair vote. This could get interesting. Gary Jones and Cheryl Williams will be debating at the 2nd District GOP meeting in Muskogee tomorrow from 1pm to 4pm (at the Library). It'll be great to have 2 dynamic, postive and energetic people leading our party with Cheryl and Don as our team! I like their message of unifying our party.